In this post, I will show you how to make a switchable guitar treble bleed prevention circuit. 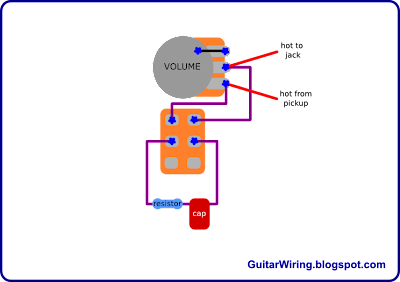 It's based on a push-pull volume potentiometer, a capacitor and a resistor. The treble bleed prevention circuit will be working, when the pot knob will be pulled up. With this modification, you will be able to reduce the treble bleed caused by the volume pot load. The mod is based on the push-pull switch, so if you will need to use the treble bleed as a guitar tone shaping tool, you will be able to come back to the classic mode, by pushing the knob. BTW, remember, the pot case must be connected to the ground. The treble bleed switch is the easy to use and really handy function. For some guitarists, it can be even more important than the tone pot.